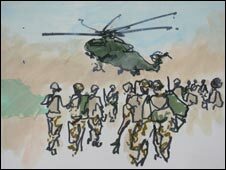 BBC News - Why do we need oil painters in a war zone? It might seem strange that the government would fly a group of artists out to a war zone, but paintings from Afghanistan are the latest in a long line of war art that apparently serves a purpose. Once upon a time artists were sent to wars because the people back home had no other way of knowing what was going on. In the 19th Century the role of war art intensified as interest in the conduct of war intensified. When the Crimean War broke out, the public back in the UK were hungry not just for the outcome of battles, but how the battle was fought, who did what, and what it looked like. With photography in its infancy, that meant sending painters and illustrators, and the likes of Edward Angelo Goodall and Constantin Guys, whose work was published in newspapers, shaped the British public's view of the war. In later wars even after the advent of more convenient cameras, artists still retained a role. Artists went where no camera could be taken. 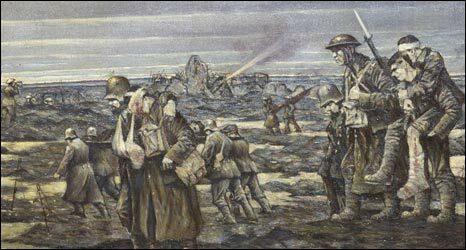 A soldier who had been running between trenches in WWI could paint his experiences on his return, while carrying a camera would have been impossible. And the feted illustrator Ronald Searle was one of a number of British servicemen who recorded their experiences after being captured by the Japanese in WWII. But in the era of blanket photographic and video coverage of the wars which Western powers are involved in, why are war artists still needed? 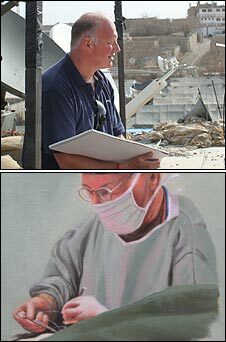 Painter Jules George recently visited Afghanistan, as part of a group of artists taken by the MoD and attached to military units. Mr George has always wanted to paint on a military theme. "I was going to join the army when I was a lot younger, but made the decision to pursue my art. I thought it would be interesting to combine my interests with my art." After contacting the Ministry of Defence and being selected for the trip, he paid for hostile environments training and looked to his art. "I did a lot of drawing to sharpen up my skills," he admits. Soon he was on a plane and deployed with 2nd Battalion, The Yorkshire Regiment (Green Howards), and able to witness a firefight with them, out on patrol. "I was on the top of a Mastiff [armoured vehicle] and we had a few rounds shot at us. I witnessed the whole skirmish." 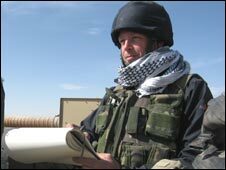 The convoy was hit by a blast, said at the time to be either a mortar round or a radio-controlled IED. It gave Mr George a chance to convey what life at the sharp end was like. After two weeks he had filled five sketch books. 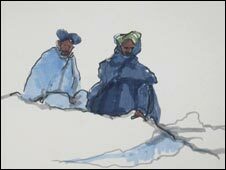 "On a trip like this it is best to do rapid fire sketches, with movement. I used my drawing book like a camera. I rely very much on the power and energy of the initial drawing." Graeme Lothian, who was sent on the same trip as Jules George, has a unique perspective. Decades ago he was a commando before breaking his back. He sees the artists' purpose as complementary to the journalists and historians who will also chronicle the war. "It's good to stand there and take a step back and just look at the Army from a distance. This will be history one day, Camp Bastion will be dust. We are painting history." "The Army have always said no to artists, now they are changing their mind. There is a sea change that artists are important." Of course, there would be some who might accuse these artists of being part of an effort to produce propaganda. "You could say that," says Mr George. "Then equally I'm very free within my own role to produce what I think are poignant images. The rights and wrongs, that is not something I want to inquire about. It is the actual fact of the soldiering." The issue of propaganda was also wrestled with during the world wars - both of which saw the deployment of artists picked by the British military. But look at paintings from World War I and it's hard to see the "propaganda" value. John Singer Sargent's Gassed, from the immediate aftermath of the war, shows a line of blindfolded soldiers, linked, and slowly moving through a foreground of dozens of other injured soldiers. In an instant it portrays the grim toll of the war. 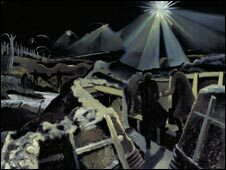 CRW Nevinson's The Harvest of Battle, also from the end of the war, shows soldiers moving gingerly through a hellish scene of filthy ponds made by shell blasts, contorted bodies and scraps of barbed wire. Paul Nash, who painted both unofficially and officially in the wars, is responsible for a number of powerful images. The Mule Track (1918) shows the sheer terrifying power of a WWI barrage, while The Ypres Salient at Night shows the illumination of an eerie section of the front. But perhaps the most startling message in his work is We Are Making a New World, echoing the tone of war propaganda. The "new world" shown in the painting is a hellish, blasted scene, with trees denuded of leaves. Nash's work is currently being featured in an exhibition in London and his stock is rising, with big sums being paid for his work at auction. It's part of a growing interest in war art, says Richard Slocombe, a curator at the Imperial War Museum. "On the most basic level it is to make some sort of record of the conflict. On a higher level it is a way of interpreting a conflict. A lot of artists feel moved to create art as a way to exploration of the emotions of war." Nash's story was noteworthy in that he started painting as an ordinary infantryman at the front, was injured, and returned to the front as an officially-sponsored war artist. Even with the authorities' endorsement, he pulled no punches. The powers-that-be wouldn't have minded getting back grim images from the front, says Mr Slocombe. "It wasn't so much what they painted. It was the fact that Britain was commissioning young artists and allowing them to express themselves. Britain was fighting the war to safeguard individual expression and personal liberty. Germany was this autocratic system setting out to suppress liberal freedoms." There is an echo of this attitude today. "What they see, they are entitled to paint," says Lt Col Kevin Stratford-Wright, who organised the artists' trip. "We are accountable. What we do isn't a secret. It is in the media every day because the MoD is helping it be there." And the artists argue that what they are doing is different to the mass media. "When Afghanistan has gone and finished the next generation won't understand. It is important to record it," says Mr George. Much of the Imperial War Museum London's war art collection can be seen in the current Breakthrough exhibition. Paul Nash: The Elements can be seen at Dulwich Picture Gallery in London until 9 May.